"This is a nice, spicy rice dish." In a large saucepan, heat oil over medium high heat. Add onion and garlic; cook for 3 minutes, stirring occasionally. Stir in broth, rice, chili powder, jalapeno peppers, and cumin. Cover, and bring to a boil over high heat. Reduce heat, and simmer for 4 minutes. Stir in bell pepper. Cover. Simmer for 5 minutes, or until liquid is absorbed. 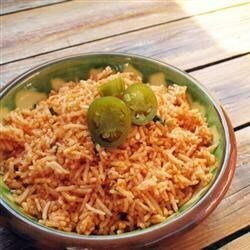 Stir tomato and shredded cheese into hot cooked rice. Great side-served it with Salsa Chicken.